5. Mosaic (Exodus 19:5). The Mosaic Covenant is a conditional covenant made between God and the nation of Israel at Mount Sinai (Exodus 19-24). It is sometimes called the Sinai Covenant or the Old Covenant but is more often referred to as the Mosaic Covenant since Moses was God’s chosen leader of Israel at that time. The pattern of the covenant is very similar to other ancient covenants of that time because it is between a sovereign king (God) and his people or subjects (Israel). At the time of the covenant, God reminded the people of their obligation to be obedient to His law (Exodus 19:5), and the people agreed to the covenant when they said, “All that the Lord has spoken we will do!” (Exodus 19:8). This covenant would serve to set the nation of Israel apart from all other nations as God’s chosen people and was as equally binding as the unconditional covenant that God made with Abraham because it is also a blood covenant. The Mosaic Covenant is a significant covenant in both God’s redemptive history and in the history of the nation of Israel through whom God would sovereignly chose to bless the world with both His written Word and the Living Word, Jesus Christ. The Mosaic Covenant was centered around God’s giving His divine law to Moses on Mount Sinai. 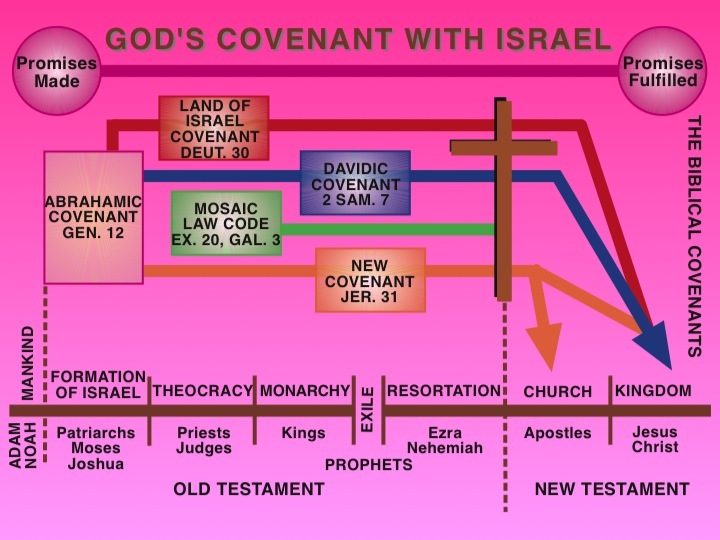 In understanding the different covenants in the Bible and their relationship with one another, it is important to understand that the Mosaic Covenant differs significantly from the Abrahamic Covenant and later biblical covenants because it is conditional in that the blessings that God promises are directly related to Israel’s obedience to the Mosaic Law. If Israel is obedient, then God will bless them, but if they disobey, then God will punish them. The blessings and curses that are associated with this conditional covenant are found in detail in Deuteronomy 28. The other covenants found in the Bible are unilateral covenants of promise, in which God binds Himself to do what He promised, regardless of what the recipients of the promises might do. On the other hand the Mosaic Covenant is a bilateral agreement, which specifies the obligations of both parties to the covenant. The Mosaic Covenant is especially significant because in it God promises to make Israel “a kingdom of priests and a holy nation” (Exodus 19:6). Israel was to be God’s light to the dark world around them. They were to be a separate and called-out nation so that everyone around them would know that they worshiped Yahweh, the covenant-keeping God. It is significant because it is here that Israel received the Mosaic Law that was to be a schoolmaster pointing the way towards the coming of Christ (Galatians 3:24-25). The Mosaic Law would reveal to people their sinfulness and their need for a Savior, and it is the Mosaic Law that Christ Himself said that He did not come to abolish but to fulfill. This is an important point because some people get confused by thinking that keeping the Law saved people in the Old Testament, but the Bible is clear that salvation has always been by faith alone, and the promise of salvation by faith that God had made to Abraham as part of the Abrahamic Covenant still remained in effect (Galatians 3:16-18). Also, the sacrificial system of the Mosaic Covenant did not really take away sins (Hebrews 10:1-4), it simply foreshadowed the bearing of sin by Christ, the perfect high priest who was also the perfect sacrifice (Hebrews 9:11-28). Therefore, the Mosaic Covenant itself, with all its detailed laws, could not save people. It is not that there was any problem with the Law itself, for the Law is perfect and was given by a holy God, but the Law had no power to give people new life, and the people were not able to obey the Law perfectly (Galatians 3:21). The Mosaic Covenant is also referred to as the Old Covenant (2 Corinthians 3:14; Hebrews 8:6, 13) and was replaced by the New Covenant in Christ (Luke 22:20; 1 Corinthians 11:25; 2 Corinthians 3:6; Hebrews 8:8; 8:13; 9:15; 12:24). The New Covenant in Christ is far better than the old Mosaic Covenant that it replaces because it fulfills the promises made in Jeremiah 31:31-34, as quoted in Hebrews 8. 6. Land (Deuteronomy 29-30). The Land Covenant (aka The Palestinian Covenant) promised that Israel would become the prime nation of the world if the Jews were obedient to God (Deuteronomy 28:1,13). But the covenant warned that many curses would befall the people if they were disobedient (Deuteronomy 28:15-37), including exile from the land (Deuteronomy 28:38-57). The covenant warned further that if temporary exile did not restore the Jews to obedience, they would suffer worldwide dispersion and persecution (Deuteronomy 28:58-68). But nowhere are they told that their disobedience would lead to a loss of their title to the land. In fact, the Land Covenant ends in chapter 30: 3-5 with a prophecy and a promise that a day will come — after the Jews have experienced the curses of the covenant — when the Lord will restore them to their land once again. 7. Davidic (2 Samuel 7:10-17). The Davidic Covenant refers to God’s promises to David through Nathan the prophet and is found in 2 Samuel 7 and later summarized in 1 Chronicles 17:11-14 and 2 Chronicles 6:16. This is an unconditional covenant made between God and David through which God promises David and Israel that the Messiah (Jesus Christ) would come from the lineage of David and the tribe of Judah and would establish a kingdom that would endure forever (2 Samuel 7:10-13). The Davidic Covenant is unconditional because God does not place any conditions of obedience upon its fulfillment. The surety of the promises made rests solely on God’s faithfulness and does not depend at all on David or Israel’s obedience. 2) God promises that David’s descendant or “seed” will succeed him as king of Israel and that David’s throne will be established forever. This promise is seen in 2 Samuel 7:12-13, “I will set up your seed after you, who will come from your body, and I will establish His kingdom. He shall build a house for My name, and I will establish the throne of his kingdom forever.” This is a reference to the coming Messiah, Jesus Christ. The provisions of the covenant are summarized in 2 Samuel 7:16, “And your house and your kingdom shall be established forever before you. Your throne shall be established forever.” The promise that David’s “house,” “kingdom” and “throne” will be established forever is significant because it shows that the Messiah will come from the lineage of David and that He will establish a kingdom from which He will reign. The covenant is summarized by the words “house,” promising a dynasty in the lineage of David; “kingdom,” referring to a people who are governed by a king; “throne,” emphasizing the authority of the king’s rule; and “forever,” emphasizing the eternal and unconditional nature of this promise to David and Israel. Many Dispensationalists of the 19th and 20th century saw two individual New Covenants, one for the Church and one for the Nation Israel. Both were launched with the blood of the Messiah. I believe that there is only one, which is addressed to the Nation Israel with spiritual benefit to the Church. It is helpful to think of a plane called the New Covenant flying full of unsaved Jewish Folks. During the Church Age the members of the Church ride underneath the plane and are launched off of it at the Rapture of the Church. This leaves the Jews to travel on the plane through the very turbulent air of the Tribulation but landing in the Kingdom at Messiah’s Second Coming. They are now all saved and as a result they receive both the spiritual and physical benefit of the New Covenant at its inauguration.. In short, the New Covenant is announced in Jeremiah to both segments of the Nation Israel (North Israel and South Judah). It has spiritual and physical blessing components similarly to the Abrahamic Covenant. Jesus ratified the New Covenant when He shed His blood on the cross. The Church received the spiritual blessing component. The Nation Israel will not receive the physical and spiritual blessings until the Second Coming of Jesus, which will usher in the Millennial Kingdom. During the Millennial Kingdom the Church will then get the physical blessings of the New Covenant as well as Israel. There are no physical blessings for the Church in the Church Age since the Church is not a physical nation but a spiritual group entered into by those who have been Born Again by the Holy Spirit. Chafer, Lewis S. revised by John Walvoord. Major Bible Themes. Fruchtenbaum, Arnold. The Eight Covenants of the Bible. n.d. <http://www.arielm.org/dcs/pdf/mbs021m.pdf>. Ice, Thomas. “Covenants and Dispensations (Part 1).” Bible Prophecy Blog. March 14, 2011. <http://www.bibleprophecyblog.com/2011/03/covenants-and-dispensations-part-1.html>. Ice, Thomas. “Covenants and Dispensations (Part 2).” Bible Prophecy Blog. March 17, 2011. <http://www.bibleprophecyblog.com/2011/03/covenants-and-dispensations-part-1.html>. Ice, Thomas. “Covenants and Dispensations (Part 3).” Bible Prophecy Blog. March 21, 2011. http://www.bibleprophecyblog.com/2011/03/covenants-and-dispensations-part-1.html. Ryrie, Charles C. Dispensationalism Today. Chicago: Moody Press, April 1999. The Bible can be separated in specific periods called dispensations. Within the the dispensations God has made eight covenants. The eight promises or covenants God made with mankind form a structure of God’s dealings with human beings. God has committed Himself to providing what we cannot. They are one of the foundations upon which all theological understanding is built. The term “covenant” in the Bible refers to an agreement made by God with human beings. This is a profound theological concept. It let’s us see that God maintains a relationship with human beings and is willing to be bound in some way to the terms expressed in the covenants. It is a solemn unbreakable agreement, such as the covenant between Abraham and God. God’s love and grace are shown in His readiness to make covenants with people. When God promised Noah that he would not again destroy the world with a flood, He made a covenant with him (Gen. 6:18; 9:9-17). A very important covenant existed between God and Israel (Ex. 24:1-8), which is pictured in the book of Hebrews as the “old covenant.” When the people repeatedly broke that covenant, God promised a new covenant based on forgiveness and the writing of his law on people’s hearts. Jesus inaugurated this new covenant with his blood (Mark 14:24; 1 Cor. 11:25). It is difficult for some to understand God’s meaning of the word “covenant.” We are familiar with treaties, promises, deals and agreements. A covenant is absolutely unbreakable. What God promises He will carry out. Some covenants are conditional and some are unconditional. The unconditional covenant is unilateral from God, and requires no adherence to the agreement for God to carry out His promises. Conditional simply means God will do what He promises if the counterparty does their part. The main biblical covenants are a unifying factor for all events described in the Bible involving God and human beings. Some of them provide the guarantee that future predicted events will occur. For example, the Abrahamic covenant is the basis for all of God’s subsequent dealings with Israel, and is expanded in the Land, Davidic, and New covenants, which, respectively, provide for Israel’s eternal possession of the land, an eternal kingship, and the conversion of a remnant. Most of the covenants have not yet been completely fulfilled. The Church is given some of the benefits of the New Covenant although it is addressed to the nation Israel. The first three were made with all humans; the last five were directed at the nation Israel. 1. 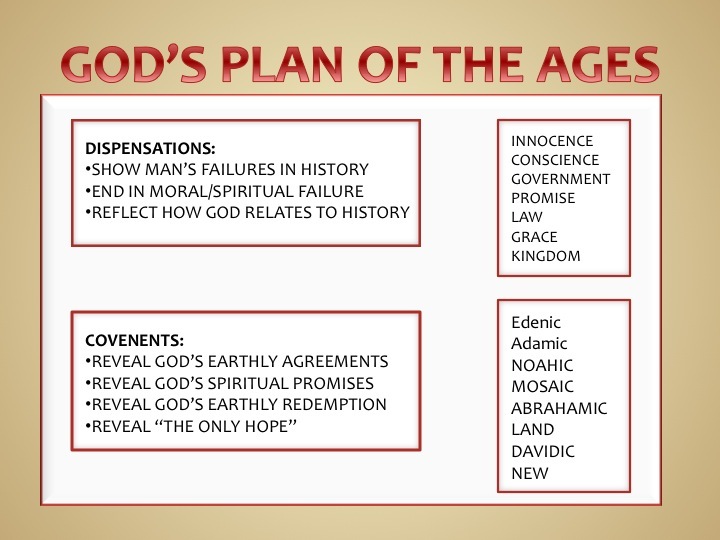 Edenic Covenant (Genesis 1:26-31; 2:15-17) God provided everything necessary for human existence in the Garden of Eden when man was innocent of all sin. There was only one simple prohibition, “…but from the tree of the knowledge of good and evil you shall not eat.” The covenant was, “I will provide everything you will need as long as you do not eat of the one tree.” Man’s life in Eden was idyllic. Living in a perfect environment he had congenial employment and perfect companionship. Even God came and communed with him. Adam was appointed as a gardener and a guardian. He was told to dress and keep the garden as well as be fruitful, multiply and subdue the earth. The prohibition was a test of his loyalty and love. The test itself tells us man was created a morally accountable creature responsible for his actions and answerable to God. This disproves the popular notion that given the perfect environment man will behave in a morally acceptable way. The Edenic covenant is one of two covenants that is conditional. 2. Adamic Covenant (Genesis 3:15-19). This covenant is unconditional in which God declared to Adam what man’s life would be like now that sin is in the world. The conditions of this covenant will exist until the Kingdom Age (Romans 8:21). There is no appeal and there is no human responsibility involved. The outcome of the arrangement is entirely based on God and His sovereign control. Elements of the covenant are the cursing of the serpent used by Satan (Genesis 3:14; Romans 16:20; 2 Corinthians 11:3, 14; Revelation 12:9), and the promise of a Redeemer (Genesis 3:15). We see in both of these prophecies advents of Christ. Prior to the fall, woman’s position in comparison to the man’s was subordinate due to Adam’s divinely ordained headship. After the fall firmer headship was invested in man due to woman’s responding to the serpent. The multiplied sorrow and pain of women in childbirth and motherhood is also mentioned. Man would henceforth earn his living by sweat (Genesis 2:15); man’s life would now be filled with sorrow and ultimate death (Genesis 3:19; Ephesians 2:5). Perhaps the most significant curse was the spiritual death, which Adam and Eve experienced “on the day they ate of the fruit.” A flaming cherub was placed as a testimonial to the restriction of the covenant. 3. Noahic Covenant (Genesis 9:16). The covenant with Noah reduced personal liberty by instituting human government. Humans were given the duty of avenging blood for blood in the post-deluvian world. (Genesis 9:6) After the flood, God made it a duty of men, and sometimes of beasts, to repay murder with the punishment of God-ordained retribution in kind. God included the animals that landed with Noah. He announced that animals would be judged for killing men, even though men were given permission to kill the animals for food. The Noahic covenant reaffirms the order of nature. Replenishing the earth (Genesis 9:1) is mentioned again as it was in past times. Then the covenant further states that now animals would fear men and that men could eat the flesh of animals. God promised never again to destroy all flesh off of the earth with a flood. Even the ground itself was promised that the whole earth would not again be underwater. In Genesis 8:22 we see God giving the order of time and the repetitive nature of it. It is constantly changing, yet constantly the same until the earth itself no longer remains. These will remain: work, seen in sowing and reaping; the elements, seen in cold and heat; seasons, seen in summer and winter; and time, seen in day and night. Even darkness will stay with us to the end of the earth. Even with Christ on the throne of all the earth, there will be nightfall, darkness, sin. 4. Abrahamic (Genesis 12:1-3; 13: 14-17 15:5, 18; 17). 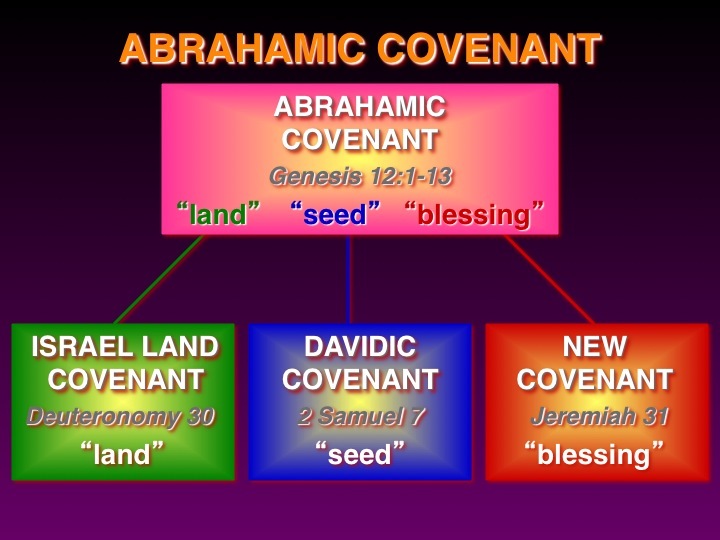 The Abrahamic Covenant promised a seed, land, and blessings. The three major promises of this covenant were personal promises to Abraham (seed), national promises to Israel (land) and universal promises (blessings) to all the people of the earth. God promised Abraham that He would bless him and make him a blessing to others, to make his name great, to give him many descendants, to make him the father of a multitude of nations, to give him the land of Canaan for always and to bless them that blessed Abraham and to curse them that cursed him. (Gen 12; 13; 15 & 17) God also made national promises concerning Israel. They are to make a great nation of his descendants; to give land from the river of Egypt to the Euphrates to his descendants forever; and to give the Abrahamic covenant to his descendants forever. Finally, God made universal covenants to Abraham that would affect everybody on the earth; it would affect all families of the earth who would be blessed. This promise is intended to be applicable to Israel regarding the blessing and cursing effects. Parts of the covenant have already been fulfilled. For example God did bless him with wealth. His name is great and Israel is a great nation. The blessings to all have been given to all through the oracles of God they received and they brought forth the Messiah. The promise of the land has not been fulfilled yet. His descendants are in the land but in unbelief and do not have possession of the boundaries set forth in Scripture yet. God has made some irrevocable, unilateral commitments – formal covenants or promises – and one of His most essential characteristics is that He delights in making and keeping His promises. Many modern churches fail to appreciate the seriousness of these covenants. 7. and in thee shall all families of the earth be blessed. Gen17: 19 And God said, Sarah thy wife shall bear thee a son indeed; and thou shalt call his name Isaac: and I will establish my covenant with him for an everlasting covenant, [and] with his seed after him.